The Department of Energy (DOE) Phase 0 Program had a goal to launch an online platform aimed at helping novice small businesses navigate the complexities of the Small Business Innovation Research (SBIR) program and the Small Business Technology Transfer (STTR) program. 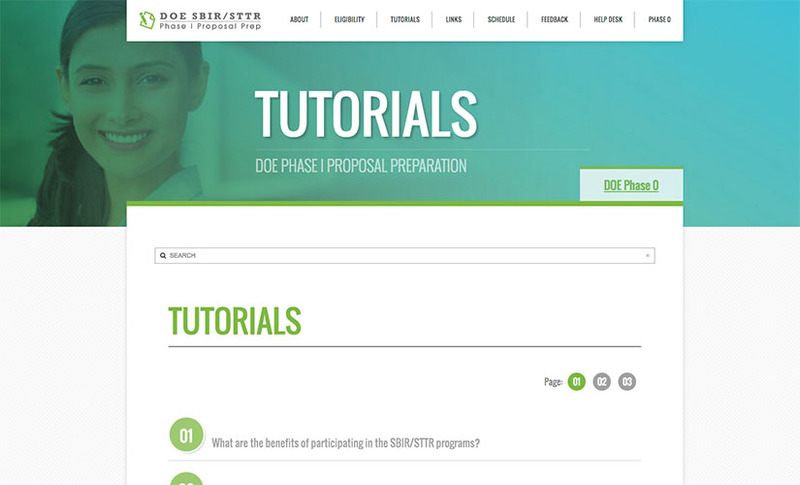 This online platform would host multiple tools and resources for learning more about the SBIR/STTR process, and would include tutorial style videos that users could watch at their own pace. 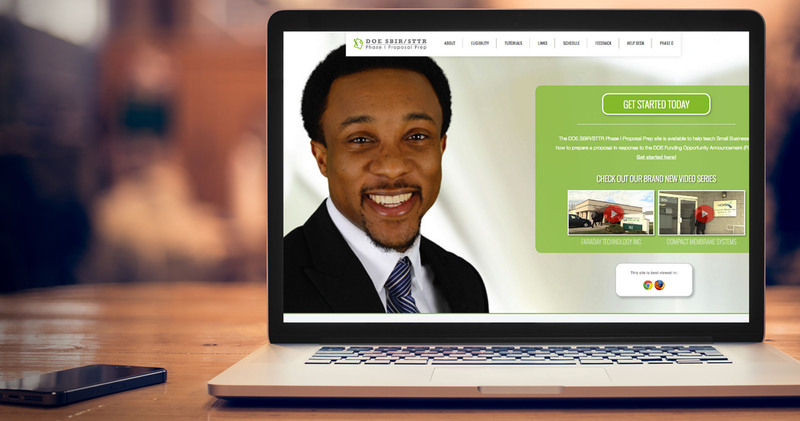 Dawnbreaker created a multimedia, user-friendly Learning Management System (LMS) that included over thirty tutorials, specialized resources like quizzes with instant feedback, and a dedicated Help Desk. The LMS combines instruction, video production, and graphic/web design to create an informative and user friendly platform. 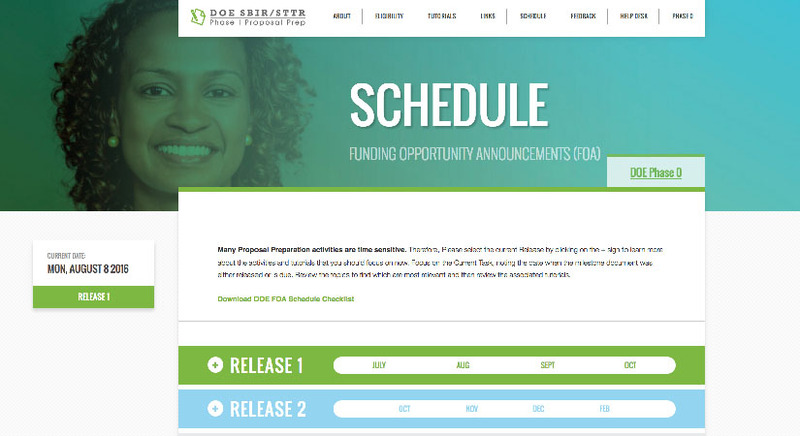 The system included a logo, a designated color scheme modeled after the DOE Phase 0 Program, and graphic elements applied to the site to enhance the user experience. The website needed to be easy to navigate, and engage users to want to learn more. To answer the obvious question of “Where do I begin?” – an “About” page was created that featured an introductory video. An eligibility quiz was also added with 10 important questions that provided immediate feedback to the user. A “Schedule” was created for help in planning key deadlines and milestones. With FOAs at the DOE being released twice per calendar year, there are many important dates and deadlines to keep in mind. Links to state resources are also provided to direct users to local small business development centers, which may also use the resources provided. A Help Desk link rounds out the key features of the LMS. Lights, Camera, Action! The prep work for the video tutorials was a months-long process and a collaborative effort between DOE, Dawnbreaker, and small businesses. Producing the video tutorials started long before the director shouted, “Action!” We first had to consider – what questions do small businesses have regarding the SBIR/STTR process? Which areas are commonly misunderstood and need clarification? From working with over 7,500 SBIR/STTR firms since our founding, we narrowed down our list of questions. We then liaised with the proposal reviewers at the Department of Energy to shed light on these questions. What makes for a good commercialization plan? What do you like to see in a Work Plan? What is the best structure for the Data Management Plan? By addressing these key issues and laying them out in an easy to digest format, we aimed to take the guess work out of the SBIR/STTR proposal process for the small business. Realizing that everybody absorbs information differently, the tutorials are delivered in several different formats. For those who get more out of the written word, text only tutorials are provided. The multimedia format utilizes both snippets of video and text so the reader may listen and view some parts, while reading others. An audio/video version is also provided which allows the user to watch the video in its entirety, without any accompanying text.